Altay®. 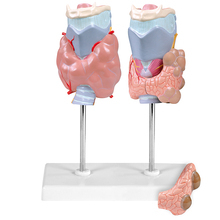 Features 2 thyroid models divided 4 ways. The first thyroid illustrates Graves&apos; autoimmune disease. The other model shows thyroid adenoma and carcinoma as compared to the normal right side of the thyroid. On stand with base. Size, 33 x 23 x 25 cm.